The SAPPHIRE NITRO+ Radeon™ RX 470 is the next big thing in mainstream 1080p gaming.Custom-designed SAPPHIRE NITRO+ models come with an energy-efficient foundation of Polaris chip and a slew of added features in both cooling and aesthetics already seen in the NITRO+ RX 480 model. Compared to the previous R9 270 generation GPU, playing on the RX 470 means performance up to 2.4x better in latest titles such as Total War: WARHAMMER or DOOM. Engineered with power savings in mind, the 4th generation Graphics Core Next chip maintains the typical board power of around 170 W. Polaris-powered GPU-s also mean improved geometry engine, increased cache and native asynchronous shaders for unmatched efficiency in DirectX 12. 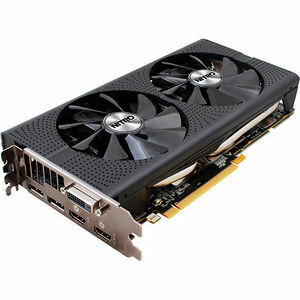 The SAPPHIRE NITRO+ Radeon™ RX 470 cards all come equipped with 2048 GCN-based stream processors and 256-bit memory interface. The 8 GB model has a GPU boost clock of 1260 MHz (1121 MHz base) and memory clocked at 2000 MHz for 8 Gbps throughput.